Climate change… one of the most relevant issues of our time. It’s back front and center on the press headlines this week because of an extraordinary summit in New York City to tackle the issue, organized by the United Nations. Next December, the annual U.N. 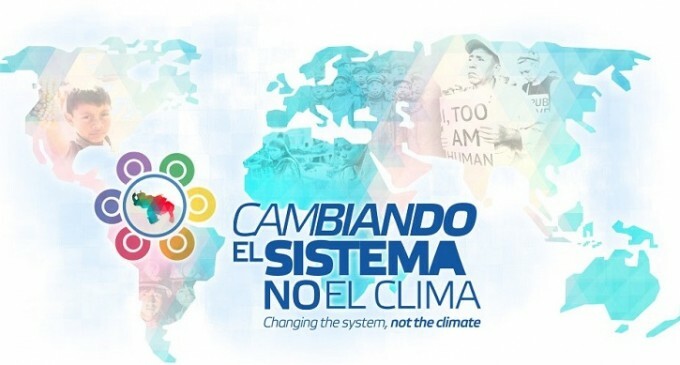 Climate Change Conference (COP20) will be held in Lima, Peru. And right in the middle of both meetings, there is supposed to be a preparatory summit right here in Margarita Island, to be held in early November. It is formally known as the Pre-COP, but the Maduro government decided to re-brand it as the Social PreCOP, transforming it into a completely different kind of summit altogether. Last year, Peru and Venezuela asked to host the COP20 (it was Latin America’s turn). In the end, a compromise was reached: Peru would host the main summit, while Venezuela would take care of the preparatory meeting or Pre-COP. But a boring preparatory meeting is the last thing the government would want. Back in 2009, the late comandante eterno used the COP15 meeting in Copenhagen to preach its message in a big way: “It’s all Capitalism’s fault”. And boy, they’re following that mantra to the letter. Don’t believe me? Just look at the Pre-COP’s slogan up above. The meeting is no longer about middle- and low-ranking bureaucrats prepping the paperwork for the heads of State who will travel to Lima. Hell no, it’s a SOCIAL summit now! Social movements! Consulting! Down with the Empire! Sadly, the UN Climate Summit will also do that. But that doesn’t bother them. Two months ago, the main framework for the summit was discussed and by reading the conclusions, it’s pretty obvious this ain’t about climate change at all. Who cares about cap-and-trade emissions when “The structural causes of climate change are linked to the current capitalist hegemonic system…”. Alternative energy sources? Establishing a counterculture and fighting colonialism should be the main priorities. Green economy? That’s a sham! “We just need to create our own dreams, forget the perverse developmentalist dream, and find inspiration in ourselves…” (Trust me, that’s written is in the document). To respond to this hugely misleading quote, I will need just four words: NO. NO. NO and… let me think… NOOOOO! Venezuela has nothing concrete to show regarding the fight against climate change, not even during Hugo Chávez’s times. Protagonist? I guess being the regional leader in CO2 emissions counts as such, thanks in part to PDVSA which has its own share of the blame as one of the most polluting companies in the world. And don’t get me started on what our infamous gas subsidy does to the air we breathe. Meanwhile, our few clean energy projects are just going nowhere. Coherence is not chavismo’s strong suit. And to confirm their true willingness to fight this problem, they got rid of the Enviroment Ministry weeks ago. Nice. The government doesn’t see climate change as a problem, but as either an excuse or a pretext for their own means. Ultimately, the fact that climate leaders allow the reckless head of a petro-state to bathe himself in a veneer of econ-respectability says volumes about the shabby state of their real commitment to the environment. Finally, you can take a couple of minutes and check out this interactive carbon map to compare the impact of all countries (including us) on climate change.